My dad and I love to go hiking, particularly around bodies of water like lakes, rivers and streams. He always says how calming the water is for him, even to watch it rushing through slats of a wooden bridge. Seeing beautiful natural water has always been a source of peace for me, too, especially during the changing of seasons. It always rushes by, even when leaves fall off the trees and birds fly south. Water’s everlasting presence attracted me to study it, but I didn’t quite know how to approach it with my journalism degree. Luckily, Emily Corio, an assistant professor at West Virginia University Reed College of Media, mentioned she was teaching a class called “Stream Lab” and that we’d be monitoring water. I jumped right into the class. 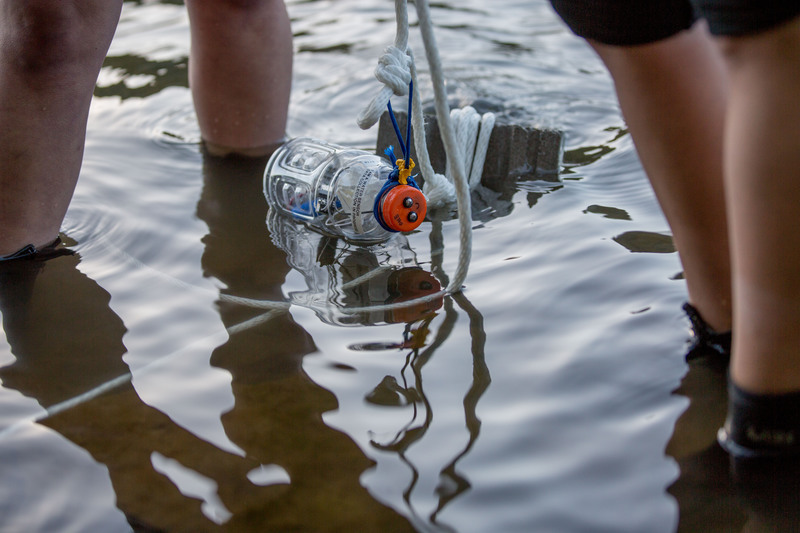 Don Blair, John Keefe of WNYC, and other Public Labbers created “Riffles” (Remote Independent Field-Friendly Logger Electronics) that our class used to monitor conductivity and temperature of the Monongahela River. At first, when Keefe and Blair came bearing gifts of bundles of wires and circuit boards, I became slightly overwhelmed because my childhood was mostly spent learning about the outdoor realm, not the computer world. But then I thought back to why I was doing this, to the world’s life source that gave me peace. I took a deep breath, shook all the negativity out of my head, and took a step into the unknown. Keefe and Blair were excellent teachers, patiently explaining how it all worked, and even how it might not work. Keefe isn’t an engineer either, which gave me more hope to better understanding and testing these systems. Riffles are arduino-based dataloggers, modified to better fit in Gatorade bottles, and we added cell modems that live-texted results to a website. Because of their low cost and simplicity, this is an easy way to collect crowdsourced data, which is a unique way to monitor a stream’s quality, compared to sparse traditional stationary monitoring stations. This project shed a brand new light for me on monitoring our water systems.